With Spain and Portugal landing in group B, the two European powerhouses are among the favorites in the tournament. Having to face each other in group play could throw a wrench in each of their plans, but the excitement level is at a fevered pitch. Let’s reveal the four teams that will be competing in group B, as well as the schedule. This will be Spain’s 15th appearance at the FIFA World Cup, and their 11th consecutive showing at the event. They have one win that came at the 2010 World Cup in South Africa, and they have only reached the final four twice in team history. Spain came in fourth place at the 1950 World Cup. Portugal is making their 7th appearance at the FIFA World Cup this year, and fifth in succession. A Seleção das Quinas’ best finish came in 1966, when they came in 3rd place. Portugal will be looking to erase their 2014 showing, in which they were eliminated in group stage. Morocco is making their 5th appearance at the FIFA World Cup, their first since 1998. The Atlas Lions had an impressive qualifying performance, that saw the team score 13 goals and only allow one ball in their net. Iran is making back-to-back appearances at the FIFA World Cup for the first time in team history. This will be their 5th overall showing at the event, although they have gone 3-and-out in all four of their other attempts. For the team roster and other highlights, check the Spain team page. Spain is the clear-cut favorite to not only come out of group B, but to take the top spot en route to the knockout stage. When the 23-man roster was announced on Monday, May 21, Spain let a few hopefuls stay home. Alvaro Morata, David Villa, and José Callejón will not have an impact on this year’s edition of the World Cup. Spanish manager Julen Lopetegui had decided to only take three forwards with him to the event. Diego Costa, Iago Aspas and Rodrigo will feature as strikers, putting even more pressure on the midfield to provide stability. The three have combined for only 30 caps, with 13 goals to their credit with the Spanish National Team. While the team lacks experience up front, they certainly make up for it in other areas of the pitch. Andrés Iniesta (125), David Silva (119), and Sergio Busquets (102) will have over 350 caps combined by the end of group stage. The three Spanish midfielders have scored 51 International goals, and they will all aid the offensive side of the ball. Team Captain Sergio Ramos has earned 151 caps with Spain, trailing only Iker Casillias (167) for all-time appearances for Spain. He and Gerard Piqué will be part of a strong back line with plenty of experience. Should Piqué stay healthy and Spain progress into the knockout round, he, too, will topple the century mark in caps, sitting on 96 to date. La Furia Roja has not fared well in recent major tournaments since their 2010 World Cup win. They did follow-up that win with another at the Euro 2012 event, but it’s been downhill since. Spain was embarrassed at the most recent World Cup in Brazil back in 2014. Unable to even break out of group stage, it led to another humiliating result in Euro 2016. Throw in a failure to even appear in the 2016 Olympic Games, which now puts Spain in a precarious situation. They are still the group favorites, but we all know Portugal will have their say in that. For the team roster and other highlights, check the Portugal team page. Any and every preview about the Portuguese National Team will start with one name, and you don’t even have to use his actual name to know who he is. Simply; CR7! Cristiano Ronaldo is arguably the greatest footballer this generation has seen. Even past generations haven’t seen majestic goals like the ones that this man has scored, and we are not discrediting anyone. Pele, and certainly Lionel Messi and Diego Maradona have had incredible careers. What a fun discussion it is when we speak of the greatest footballers in the history of the game. A Major trophy was something that eluded Portugal and Ronaldo, until the 2016 European Championships. Now that they have gotten that out-of-the-way, it doesn’t change how much pressure there still is for Portugal to perform well in Russia. Portuguese manager Fernando Santos made some interesting choices in his 23-man final roster announcement. Some of the players who had an influence on their recent success were left home. Renato Sanches and Eder were both vital parts of their 2016 European title run, but both will be left off the plane to Russia. Even though Andre Silva had an extremely disappointing campaign with AC Milan this past year, he was still chosen to play upfront with Ronaldo and Ricardo Quaresma. Quaresma has 74 caps to his credit, but has only tallied 9 goals for Portugal. João Moutinho has already played in two World Cups, carrying 107 caps in to the tournament. The 31-year-old will lead a relatively young midfield. Bruno Alves (36), Pepe (35), and José Fonte (34) lead an experienced back line that will be playing in front of GK Rui Patrício. Alves and Pepe have combined to achieve 187 caps, chipping in with 16 goals between them. Portugal and Spain square off right away in group stage, making that a pivotal match for placement in group B right out of the gate. It will be hard to rationalize the chances of either Morocco or Iran advancing to the knockout round. That is why they play the matches, so let’s see what those two are bringing to the table. For the team roster and other highlights, check the Morocco team page. Morocco manager Hervé Renard took over the sidelines back in February of 2016. The well-traveled Frenchman has coached 12 teams in his 19-year managerial career. He has never really settled anywhere particular, but he is signed with Morocco through 2022. Whatever he has done it is working, and it was extremely evident in qualifying that this team wanted to be here. Morocco opened FIFA World Cup qualifying in the CAF (Confederation of African Football) second round, where they defeated Equatorial Guinea 2 – 1 on aggregate. Morocco landed in group C with the Ivory Coast, Gabon, and Mali. The Atlas Lions scored 11 goals and didn’t concede a single goal in group C play, to directly advance to the World Cup in Russia. Whether you respect the competition from the group or not, that is an impressive performance at any level. Morocco is on a nice run of 15 straight outings without a loss in all competitions since June of 2017. That includes Friendlies, World Cup qualifiers and Africa Nation’s Cup affairs, respectively. Not a shabby calendar year of results at all, but can they turn it to success in group B play? Opening with Iran to kick off group stage, instead of Portugal or Spain, is certainly something positive. That does, however, put a lot of stock in finding a result in their opening fixture of the tournament. Team Captain Medhi Benatia brings some championship experience to the Moroccan defense. He just helped propel Juventus to their seventh straight Italian Serie A title this past campaign. Nabil Dirar and Manuel da Costa, both age 32, have a combined 49 caps on the back line for Morocco. Striker Khalid Boutaïb scored four goals in CAF World Cup qualifying, and he has scored 7 goals in only 15 appearances with the Morocco National Team overall. Likely joining him in the attack is youngster Ayoub El Kaabi, and he has already made an impact with the team. His performance at the African Nation’s Championship led Morocco to their first ever title at the event this past February. Let’s turn our attention to Iran and finish with the predictions for group B.
Iran is hoping that their fifth appearance at the FIFA World Cup goes better than their four previous attempts. Team Melli has failed to escape group stage in any appearance at the FIFA World Cup. They’ve been outscored 22 – 7 in 12 matches played, and have a single win to claim in team history. That win came back in 1998, but they are hopeful that a consecutive appearance on the grandest stage in sports, can be built on. Iran, as mentioned with Morocco, will likely be putting a massive effort towards taking any type of result from their opening match in group B play. Both teams know that Spain and Portugal loom ahead. Whomever finds points on June 15 at Krestovsky Stadium when the two square off will have the best chance to remotely hope to advance to the knockout round. Portuguese manager Carlos Queiroz doesn’t exactly have a choice of household names to rely on. Iran’s three highest capped players all play in Greece domestically. Midfielder Ehsan Hajsafi leads the team with 92 caps, and he is teammates with forward Karim Ansarifard at Olympiacos. Ansarifard has scored 16 goals in his 62 appearances with Iran. Team Captain Masoud Shojaei plays at Athens domestically, and has 72 caps with Iran which is second on the team to Hajsafi. The five forwards that Queiroz chose to bring to Russia all have combined to earn 174 caps, while scoring 71 goals as a unit. Iran has a relatively young back line, and their featured goal keeper, Alireza Beiranvand, has only appeared in 20 games for the team. One might expect some struggles against the likes of Portugal and Spain, who can obviously both find the net. The best approach Iran could have, would be to try to have fun and do the best they can, obviously. At the same token, a back-to-back appearance at the FIFA World Cup brings expectations of sorts. A fifth complete failure could prove costly should Iran come away with no points, and another quick plane ride home. Is there a surprise here? Naturally, every outlet and pundit who follows the game will likely have Spain and Portugal advancing out of group B. 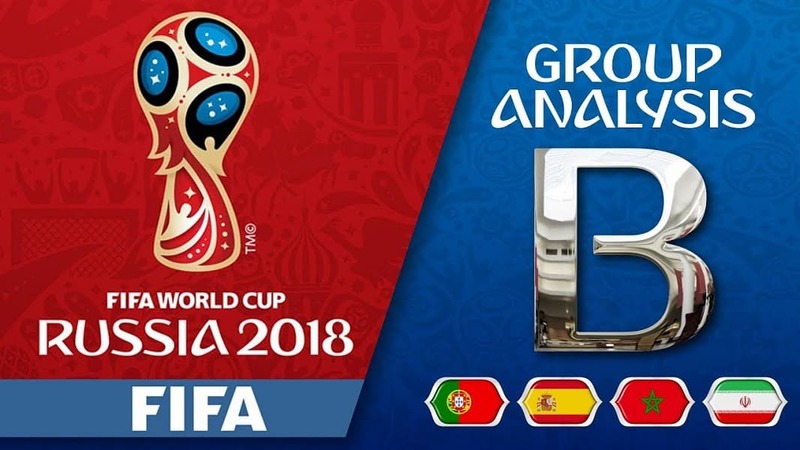 As a well-regarded tipster in my own right for the last 25 years, offering Spain at -200 to win the group holds no value to true bettors in the industry. Putting up $100 USD to win $50, simply takes the excitement out of the action. Portugal to win the group at +185 is certainly worth a look. Portugal is an underdog in their opening match against Spain on June 15, but they are playing better as a team lately. Most of the players on the pitch for Spain and Portugal know each other quite well. Six players on the Spain roster play with Ronaldo at Real Madrid who, in fact, still have a trophy to play for. We are all looking forward to the Champions League Finale between Real Madrid and Liverpool on May 26. Regardless, outside of a play on Portugal at +185 to potentially take group B, it holds the best value since Portugal could certainly find a result against Spain. Portugal can hope to score enough goals in tie-breaking scenarios that could factor in as well. If you are someone who will be looking for plays on the matches during the FIFA World Cup, check out my website I will be covering the entire tournament on a match-by-match basis, as well as writing the previews for the groups.